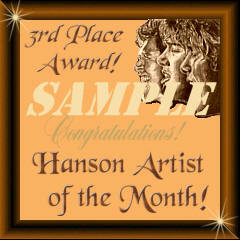 So you want to see what the awards will look like for the monthly Hanson Artist of the Month contest? I have re-vamped the look of the awards, so if you have won my award in the past, just email me and I will email it to you! 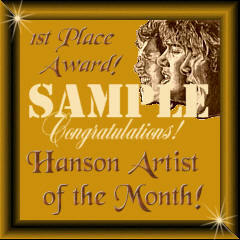 These are the samples of the awards you will receive! It will be emailed to you when you win and to proudly display it either on your site or print it out for your personal pleasure.